At CBR, we continuously stock the 6000, 6200, and 6300 series, up to a 100mm shaft size, for same-day delivery. Larger sizes are available with short lead times. We also offer quick turnarounds on the 5200 and 5300 series double row bearings, as well as the 7000, 7200, and 7300 series angular contact bearings. 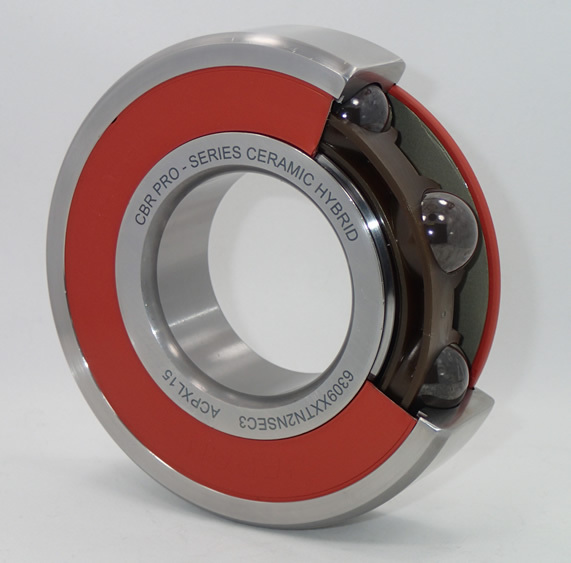 Our Pro-Series ceramic hybrid ball bearings are the finest available. The CBR Pro-Series ceramic hybrid bearing is built to a level of quality and detail not available in a mass produced bearing. We start with the highest quality Japanese bearing rings and aerospace-grade silicon nitride balls. We check the radial play to within a tenth of a thousandth of an inch (.0001”), using precision test fixtures. We individually micro-polish the raceways to a flawless mirror finish. In addition, during final assembly, all raceway surfaces and the inside surfaces of the cage are completely coated with grease, eliminating dry spots and assuring that all dynamic surfaces are completely lubricated. These steps guarantee that each and every bearing we sell is accurate and consistent. The result is a bearing that runs smoother, lasts longer, and requires no run-in time. Not all ceramic bearings are created equal. The heart of the ceramic hybrid ball bearing is the ceramic ball itself. Poor quality balls can fail, often with disastrous results, but the high-quality, aerospace-grade balls used by CBR will not chip, fracture, or fail, even under the harshest of conditions. CBR bearings use proven cage designs and modern grease. Bearings with a 50mm bore size and larger use an ultra-reliable, two-piece stamped steel cage, while the smaller bore sizes typically use a precision molded, high-speed polyamide cage. The standard lube used in our sealed bearings is Mobil Polyrex EM. Other types of grease are available by request. We can build less common sizes to your specifications. CBR also has the unique ability to convert your steel ball bearings to ceramic hybrid (50mm bore and larger). Please contact us for more information. Ceramic hybrid ball bearings are electrically non-conductive. The non-conductive silicon nitride ceramic balls in our ball bearings eliminate electrical arcing through the bearing, crucial in applications where an electric motor is controlled by a variable frequency drive (VFD). Ceramic hybrid ball bearings last longer. Ceramic hybrid ball bearings last up to ten times longer, according to SKF, the largest and most respected bearing manufacturer in the world. Ceramic hybrid ball bearings perform with 40% less friction than a comparable steel ball bearing. Less friction equals more power and less heat build-up, resulting in significantly higher efficiency and an increased RPM rating of 25%, when compared to a steel ball bearing. At CBR, ceramic hybrid ball bearings for the industrial electric motor repair industry are our main focus, so we stock all the common series of bearings, up to a 100mm shaft size, for same-day delivery, reducing downtime for our customers. Less common sizes can usually be built with short lead times, helping you get your motor back up and running sooner. All of our ceramic hybrid ball bearings are electrically non-conductive, last longer, and perform with 40% less friction than traditional steel ball bearings. We are able to offer great prices because we sell our ceramic hybrid ball bearings directly to the electric motor repair industry, eliminating middleman costs. CBR Bearing Inc. specializes in high-end ceramic hybrid ball bearings for the industrial electric motor repair industry. Ceramic hybrid bearings are widely used as a performance upgrade in two- and four-stroke racing motorcycle engines. We offer ceramic hybrid front wheel and rear axle bearings specifically for the karting industry.